Weinberg's works are strong, beautifully crafted and grippingly original. They equally embrace influences that range from Jewish cantorial music and Yiddish Theatre to his abiding and deep mutual friendship with Dmitri Shostakovich at the vanguard of Russian Modernism. The music of Polish-Russian-Jewish composer Mieczyslaw Weinberg, hardly known a generation ago, has been dispersed by the efforts of the Naxos label to record neglected 20th century symphonies and Russian expat conductors. His chamber music, however, remains a rare find, and what a find it is. Weinberg lost his family to the depredations of the Nazis in Poland, and ended up on the bad side of Soviet authorities as well despite the support of Read more Shostakovich, who influenced his music. The Piano Quintet, Op. 18 (1944), one of the first works he wrote in the Soviet Union, has the deadly serious tone of Shostakovich's chamber music during World War II, and it's altogether remarkable, a chaotic statement from the midst of wartime as powerful in its way as the Shostakovich Symphony No. 7. The Attacca Quartet from the U.S., not a country known for great Shostakovich performances, is up to the work's considerable emotional (not to mention technical) challenges. Sample the second of its five movements, with the sardonic effect created by the long passages pairing the piano with pizzicato strings. The integration of the piano and the string quartet is masterly throughout. Both this work and the Sonata No. 2 for cello and piano, Op. 63 (played here by Attacca Quartet cellist Andrew Yee and the pianist from the quartet, Jeanne Golan), are cyclical in form and add deep resonances to that device. The Sonatine for piano, Op. 49, is something else again, a counterpoint to Shostakovich's piano preludes. 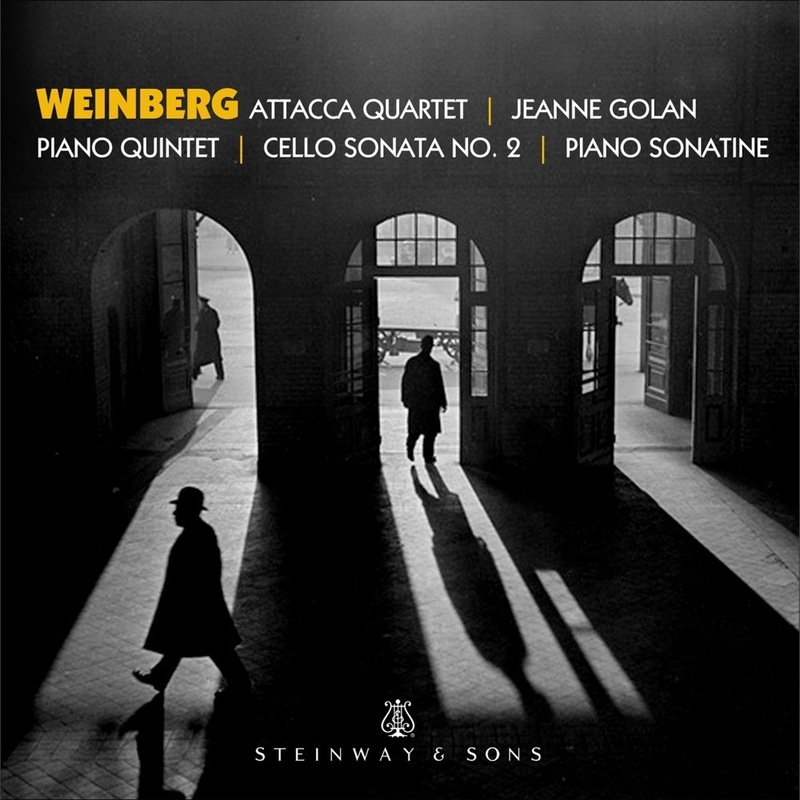 Although the presence of Shostakovich looms large, there is always something distinctive to Weinberg himself in the music here, and if you've been avoiding Weinberg on the suspicion that he may be derivative, this is a good place to start. Excellent and idiomatic sound from Steinway Hall in New York is another attraction. Period: 20th Century Written: 1944 USSR Date of Recording: 6/13–15/2017 Venue: Steinway Hall, New York City Length: 47 Minutes 20 Secs. Period: 20th Century Written: 1951 USSR Date of Recording: 6/13–15/2017 Venue: Steinway Hall, New York City Length: 6 Minutes 52 Secs. Period: 20th Century Written: 1958 USSR Date of Recording: 6/13–15/2017 Venue: Steinway Hall, New York City Length: 22 Minutes 27 Secs.